NutriBiotic Electro-C, Cherry 8 oz. NutriBiotic Cherry Electro-C is an effervescent, vitamin C and electrolyte powder delivering vitamin C and highly bioavailable electrolyte minerals (calcium, magnesium, chloride, potassium, sodium, and zinc)† in a readily soluble form. Vitamin C is an essential nutrient that cannot be produced by the body. Electrolyte minerals are utilized (through use) and lost (through sweating). Therefore, vitamin C and electrolytes must be replenished. Electro-C is a fresh and tart, sparkling, non-caloric, vitamin C, and electrolyte drink providing 950 mg of vitamin C and an array of electrolytes per serving. Cherry Electro-C has a natural cherry flavor and is lightly sweetened. †All the minerals are mined from the earth. L-ascorbic acid USP-FCC* (C6H8O6), calcium carbonate-USP, magnesium carbonate-USP, potassium bicarbonate-USP, natural cherry flavor, sodium chloride-USP, stevia, and zinc sulfate-USP. Made without milk, soy, egg, yeast, wheat, no rose hips, animal products, fillers, lubricants, binders, starch, colorings, and preservatives. 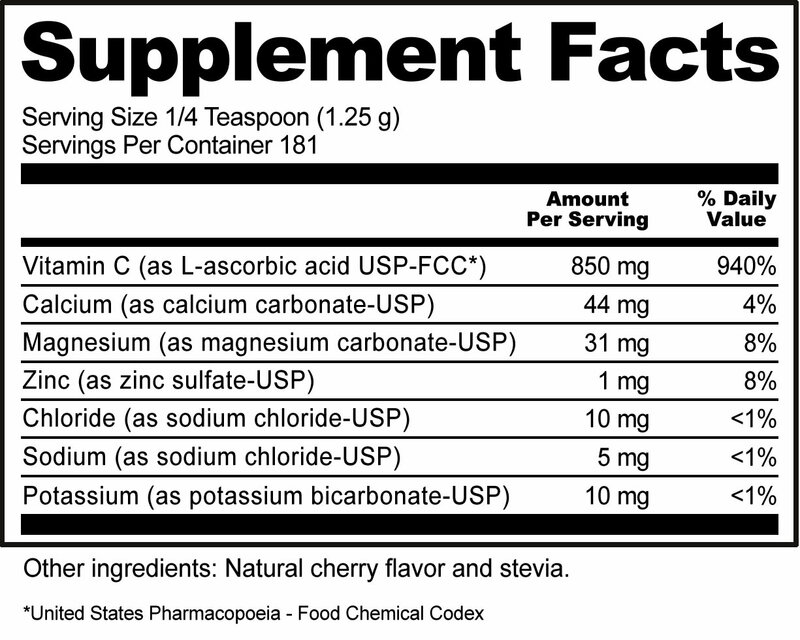 As a dietary supplement, mix 1/4 teaspoon or more into a glass of juice or water. Take with or without meals.